Last week, the League of Women Voters of Seattle and King County held a well-attended debate between the two candidates running for Secretary of State this year — Republican incumbent Kim Wyman and Democratic challenger Tina Podlodowski. A key topic discussed at the debate was what to do about voter turnout in Washington State, which has been declining for years. QUESTION: Next topic: Voter turnout. How would you increase voter turnout in our state? TINA PODLODOWSKI: So voter turnout has been going down steadily under the current Secretary of State — every year for the last four years she’s been in office. Sometimes in looking at it, you compare it to the prior four year election, you look at seventeen percent declines, fourteen percent declines, nine percent declines… How do you change that? You do a couple of things. Number one is the big policy issues. Automatic voter registration. Same-day registration. Preregistration for sixteen and seventeen year olds. And postage free ballots, which hopefully we’ll talk about more because of what’s happening in Snohomish County today. Also, you need to do the work with county auditors, but also on the ground with good governmental organizations and nonprofit organizations in communities. That’s why you do that thirty-nine county audit. That’s why you have the numbers that show where are the problems. Is it with young people in the county? Is it particular communities of color? Is it a particular gender that’s having issues getting to the ballot box? You need to do that work and craft a strategy through the Department of Voter Engagement — that’s what my group would be called as Secretary of State, to make sure there’s a plan to get that done. KIM WYMAN: So, when we’re talking about voter turnout, let’s go back to manipulating data. It was brought up by The Olympian and The News Tribune that… that when you just make that comparison and you cherry pick elections and you compare ’em, you can make some really inflammatory assumptions about turnout. But when you actually compare what turnout is… Turnout really is a function of what’s on the ballot. And when we look at presidential years, it’s [the] highest turnout year… Midterms follow second, and then the odd-year primaries and generals are the lowest turnout. And so, when you look at Washington State… in 2010, we had really high turnout, because we had really inflammatory issues on the ballot that had people fired up about taxation. So, what I’ve always tried to do, as County Auditor and now as Secretary of State, is to do things that really empower people to get their ballot in easily. We were the first county in the state to have drop boxes, for example. When I left Thurston County, we had more drop boxes than King County did at the time, and we were a tenth of the size of King County. So it’s about innovative ideas. I was present at the debate and found Wyman’s answer to the turnout question very disappointing and puzzling. If inflammatory tax initiatives drive turnout, then the presence of Tim Eyman‘s controversial and incredibly destructive I-1366 on the ballot last year ought to have helped motivate people to return their ballots. Instead, we saw the worst general election turnout in the history of the State of Washington. Yes, you read that correctly… the worst general turnout ever! What’s on the ballot can influence turnout — but it’s hardly the only factor. You’d think our incumbent Secretary of State would be alarmed at the downward spiral we have been seeing with voter turnout — a trend I documented last month here on the Cascadia Advocate. But Wyman doesn’t seem to want to acknowledge that the problem exists, let alone offer solutions to address it. Tina Podlodowski is correct when she says voter turnout is declining, but she continues to be criticized by reporters for a video and a graph her campaign previously published that don’t distinguish between different types of elections. “Podlodowski paints a misleading picture, comparing turnouts from elections that have little in common,” was how The Seattle Times’ David Gutman characterized it yesterday in a story for the state’s newspaper of record. 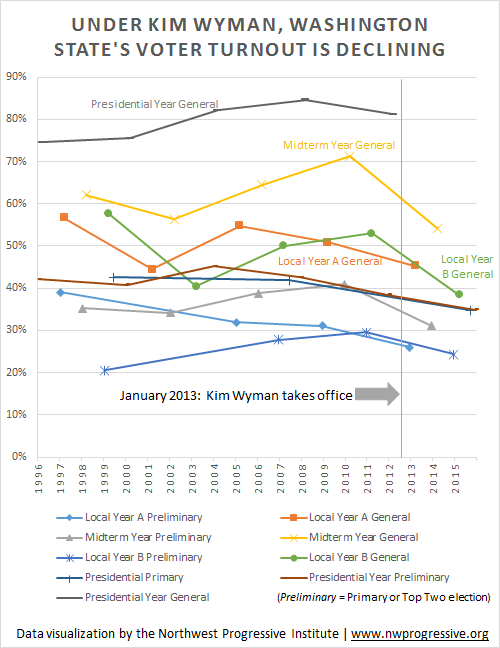 Context does matter, but what the data shows is that every statewide election that has been held during Kim Wyman’s tenure as Secretary of State has seen lower turnout than the comparable election four or eight years prior. There’s not even one election that’s bucked the trend. Sometimes the declines are slight, and sometimes they’re steep. But turnout is declining across the board. That’s a fact. To illustrate this point, here is a brand new chart, created by NPI, that compares voter turnout in similar elections in Washington State. And by that, I mean that presidential year general elections are being compared to previous presidential year general elections, midterms to midterms, local elections to local elections, and so on. There are a total of nine different election types being compared in this chart, and the data points for each type are plotted on their own line. The chart shows data going back twenty years in an attempt to offer meaningful context. The first election in the chart is the September 1996 primary election, held in a presidential year. The last is the August 2016 Top Two election. The figures used for the comparisons here are percentages — specifically, the percentage of registered voters who returned ballots in each election. All percentages were provided by data published online or sent to NPI by the Secretary of State’s office. There are two types of local election years: those that follow a presidential year and those that precede one. Local elections that follow a presidential election are classified as “Local Year A” and those that precede as “Local Year B”. Because many local positions are for four year terms, Local Year A elections are most similar to other Local Year A elections, and vice versa. Each line, with two exceptions, contains a data point every four years, or, in the case of the presidential primary, every eight years. Data points for the 2001 and 2003 blanket primaries aren’t included because the Secretary of State does not have complete statewide numbers for them. Notice how every line — every line — is presently pointed downward. Again, across the board, looking at every type of election, turnout is headed in the wrong direction. That is true even so far this year — and this is a presidential election year! Now, as I said in my previous post, Kim Wyman didn’t cause this alarming trend. But she isn’t doing anything to arrest it or reverse it. And she should be. Gutman and his editors at the Times opted not to do a deep dive into Washington’s turnout data for the story they ran yesterday. For context and commentary, they turned to a professor at the University of Florida, who reinforced and repeated Wyman’s excuses for the state’s recent poor turnout. Elections are mostly not comparable to one another; turnout in presidential years is higher than in midterm years, which, in turn, are higher than in off-year elections. Even among similar elections, turnout varies based on factors like whether there’s a competitive U.S. Senate or gubernatorial race on the ballot, or a high-profile initiative. But turnout in off-year elections (held in odd-numbered years) has declined since 2011, setting a record-low last year. Turnout statewide dropped from 53 percent in 2011, to 45 percent in 2013 and 39 percent last year. Wyman says that’s part of a national trend. She said Washington still had higher turnouts than most places. We disagree with Professor McDonald. Washington is not doing “pretty good” with respect to voter turnout. Outside of the last two presidential elections — the only recent elections we’d characterize as “pretty good” — Washington’s turnout lately has ranged from okay to mediocre to historically abysmal. When less than a majority of the registered voters are voting, particularly in a general election, it means laws are being made and officeholders elected by the few, not the many. That’s unhealthy for a democracy. That’s not something we should accept. We should have high standards for ourselves. Part of the problem we have stems from how we talk and think about elections. Case in point: There is no such thing as an “off year” election, there are only “on” years. In Washington, every year is currently an election year and every election matters. “Off year election” needs to be banished from everyone’s vocabulary. Incumbent Secretary of State Kim Wyman has a responsibility to sound the alarm about our turnout problem and propose solutions to address it. Instead, she keeps trying to make it sound like the trend is something she has no control over. Washington is not immune to national trends, to be sure, but if there’s a bad trend affecting the whole country, then we want to be bucking that trend. Participation in democratic elections is not some kind of natural force like the tides. It is within our power to bolster turnout, and one way to do that is to eliminate barriers to voting. We ought to have more drop boxes, prepaid postage on ballots, automatic voter registration, and same day registration, for instance. Those are reforms Tina Podlodowski embraces. Kim Wyman? Sadly, not so much. They’re simply not part of the vision she has outlined for the next four years. © 2019 The Northwest Progressive Institute. The Cascadia Advocate loaded in 0.218 seconds.